We’ve been doing some background reading preparatory to launching RiverRhee’s new course on leadership, as the next step on from our Introduction to Management. Claudio Feser’s new book has been giving us a lot of food for thought. The book is based on McKinsey’s practical experience and study of academic literature, and lays a strong emphasis on the qualities and skills of inspirational leadership. Claudio Feser reassures us by saying that these skills can be learnt: they are a set of behaviours that address people’s “true inner motivators, values and emotions”. The basis of this type of leadership is to have a strong focus on the goal to be achieved, to influence people in such as way that they are committed towards a course of action, and to encourage and support them to take ownership for their actions. These behaviours are also symptomatic of having a strong emotional intelligence, and the ability to clearly articulate the vision or goals for an organisation. Although Feser does not mention Robert Dilts’ neurological levels of change, there is a strong connection to this NLP (NeuroLinguisticProgramming) model. Readers of my blogs will have picked up my digest of the Harvard Business Review (HBR) article about Oxytocin, trust and employee engagement. The March – April issue of HBR continues the exploration of neuroscience in the context of personality tools, and Feser has a chapter on this topic too. Leaders would do well to familiarise themselves with the current thinking on this topic, and also consider which personality (or psychometric) tools to use to aid their understanding of the strengths and diversity within their team. We use tools such as MBTI (Myers Briggs Type Indicator) Belbin Team Roles to support our training for managers and teams, and will explore personality tools further in our leadership training. We know that effective managers and leaders adapt their approach based on the context and the people that they are dealing with. I ‘grew up’ in the business world on Robert Cialdini’s “Influence: Science and Practice”, and am also a strong advocate of the strategies described in “Influencer – The new science of leading change”. We use aspects of these in RiverRhee’s Managing Change, and Communication and Influence courses. Feser introduces a set of nine hard and soft approaches for influencing, based on the work of Kipnis, Schmidt and Wilkinson. He describes how an inspirational leader will adapt which approach she or he uses with individuals based on the context, the knowledge, skills and mind-sets of the people involved. So for instance, hard tactics will be most effective in simple, clear situations with some sense of urgency, whilst softer ones will be best for dynamic, complex and ambiguous situations. Another example, according to Feser, is that inspirational appeals will be most effective where people have strong values, and with those who are more energetically outspoken. Whilst socialising strategies, those that start with something like “I see the problem exactly the same way…”, work well with knowledgeable people and those who are very conscientious about their work. Again, these are all activities that are within the control and sphere of influence of inspirational leaders. We look forward to bringing these concepts, and more, into our new course on leadership in the not-too-distant future. We are preparing to deliver our 10th Introduction to Management course since we first started running it in 2013. Our 60+ alumni, from 20+ organisations, know that we are committed to continuous improvement, to ensuring that managers receive the very best guidance to help them and their teams excel in their work. We do this by acting on the feedback that we receive, and by monitoring and incorporating what external experts are saying and doing across the 13 modules that we cover in the course. You can read more about our goals for excellence, how we are doing, and our forward plans, at the end of this newsletter. For now, for the benefit of our alumni in particular, here are some extracts from two issues of the Harvard Business Review that we feel support the benefits that we focus on: how to help you become more confident and capable in your role as a manager. Amy Gallo. Get your team to stop fighting and start working. HBR June 09, 2010 – thank you to Tony Jones of One Nucleus for sharing this with members earlier this year. Many of the managers that we work with have been promoted to this role because of their strong performance in their previous scientific or technical role. It can be disorientating to then find yourself in a role with different criteria for success. You may also have to manage people who were previously your peers, have more years’ experience, or who have different areas of expertise from your own. Linda Hill reminds us that a manager does not have automatic authority in these situations, and that, in fact, an autocratic and controlling (or micro-managing) approach is the last one to aim for. Instead, she suggests that your power as a manager will come from your ability to listen to your direct reports, and then exercise judgement and influence to get them and others to do the right thing. It’s about ensuring that the goals are clear and that individuals take accountability, supported by the high level guidance that you give them. The last point in the previous section also emphasises the balance that you should be aspiring to as a manager: to delegate more of your work so that you can then focus outwards from the team. This will enable you to concentrate on developing relationships within and outside the organisation that will anchor your team and its work more strongly in its wider environment. Linda Hill argues that you should be focusing on what will make the team successful, rather than focusing exclusively on the individuals within the team. This seems like a balancing act too. We use John Adair’s model with the three overlapping circles of individual, team and task. You do need to understand and build rapport with the individuals within your team, but not to the exclusion of the overall success of the team. Linda Hill’s previous points about having a whole team and an external orientation mean that you will be better able to make objective decisions about what you need to do to ensure that your team is performing at its best and to make the changes needed to meet your strategic goals. Amy Gallo has some more tips on how to create a high performance team, a topic also covered by one of the modules in our course. Like us, she acknowledges that conflict is a natural and healthy feature of team dynamics. She also suggest that there are things you can do to minimise the damage, such as making time to agree and reinforce the team purpose and its norms (or ground rules). She stresses that is important not to let conflict fester, to discuss it early and to resolve it as a team, and to then ensure that those involved get re-engaged quickly in some group task, however small. We will bring all of these ideas, and more, into future iterations of our Introduction to Management course, the next one of which is scheduled for the 15th-17th November. Do get in touch if you, or others you know, might be interested in coming along. 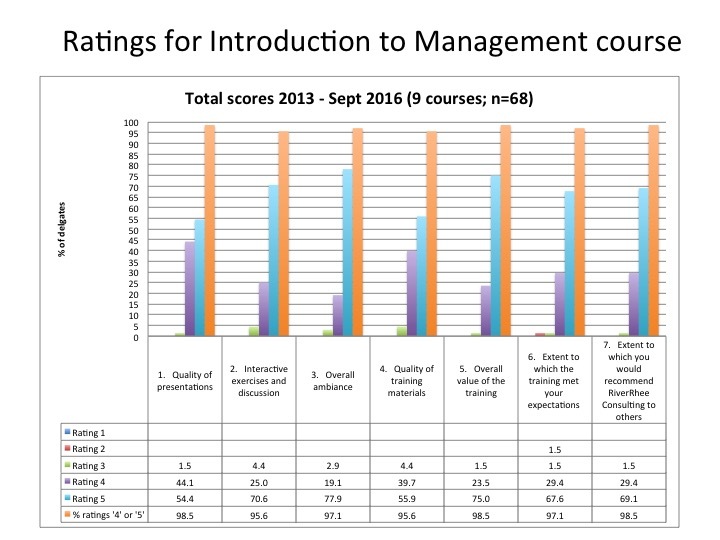 We use Kirkpatrick’s first and second levels for evaluating our courses: delegates’ ratings of the course against various criteria combined with their comments on how they will apply what they have learned. Our target is to achieve consistent (100%) ratings of 4 or 5, on a scale of 1-5 where 1 is low and 5 is high, across all the criteria that we assess in our end of course feedback. We are currently achieving 98.5% 4 or 5 ratings for the quality of our presentations, the value that delegates gain from the course, and the extent to which they would recommend RiverRhee to others. From November we are going to start including more insights from external experts, enhancing the style of our hand-outs, and exploring the best approach to and balance of individual and group discussion and exercises. We have also, reluctantly, decided that we have outgrown our current training venue at the Melbourn Community Hub for the 3-day course, and so have booked the more spacious Copley Hill facility near the Babraham Research Campus, for 2017. Our 1-day courses tend to attract smaller numbers, so those will continue, for now, in Melbourn. Would you like to work with us to develop your managers and your teams? Are you, or someone you know, interested in attending our November 15th-17th Introduction to Management course?